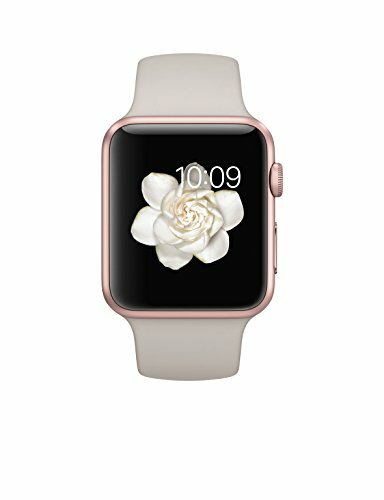 Rose Gold anodized aluminum case, Ion-X glass, Digital CrownRetina display with Force Touch Speaker and microphone, Wi-Fi (802.11b/g/n 2.4GHz), Bluetooth 4.0 Sport Band with stainless steel pin Heart rate sensor, accelerometer and gyroscope; Ambient light sensor Up to 18 hours of battery. --Rose Gold anodized aluminum case, Ion-X glass, Digital CrownRetina display with Force Touch. --Speaker and microphone, Wi-Fi (802.11b/g/n 2.4GHz), Bluetooth 4.0. --Sport Band with stainless steel pin. --Heart rate sensor, accelerometer and gyroscope; Ambient light sensor. --Up to 18 hours of battery. GLONASS, Galileo, and QZSS, Barometric altimeter, Optical heart sensor, Accelerometer and gyroscope, Ion-X strengthened glass, Ceramic and sapphire crystal back (center). 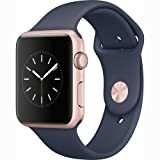 Includes Aluminum Case Watch, Generic Band, Charging Cable, power Adapter. Wi-Fi (802.11b/g/n 2.4GHz), Bluetooth 4.2. Up to 18 hours of battery life. Optical heart sensor, Digital Crown, S2 Dual-core Processor. Accelerometer and Gyroscope. swimproof. Item Is In Excellent Condition. Watches are 100% Functional. This item will not be in the original packaging and includes MFI certified power cable and UL approved power adapter. 60 days seller warranty included. Device may show some light scuffs or marks from handling.